Activists Build Human Rights Abuse Cases With Help From Cellphone Videos : Parallels A human rights group finds itself with an interesting problem — an overwhelming number of videos to catalog as it builds legal cases. Computer scientists are creating tools to analyze the videos. 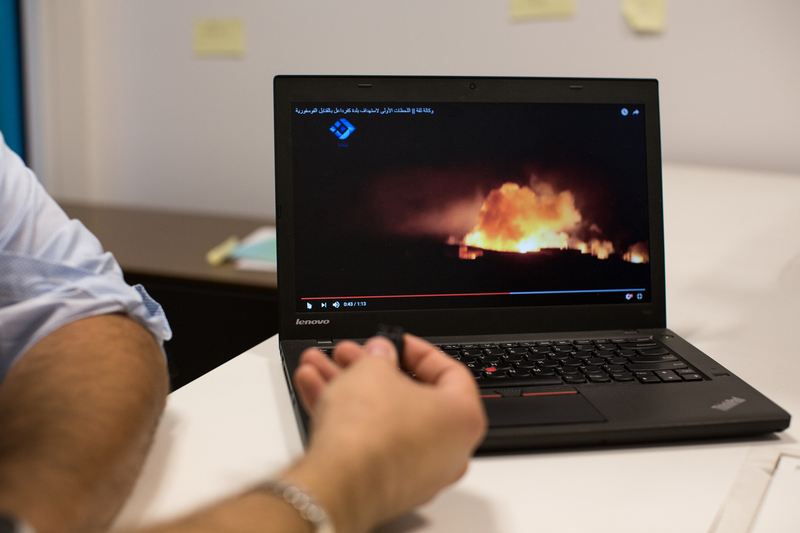 Mohammad Al Abdallah, the executive director of the Syria Justice and Accountability Centre, shows a video that was posted to YouTube of illegal cluster bombing in Syria. 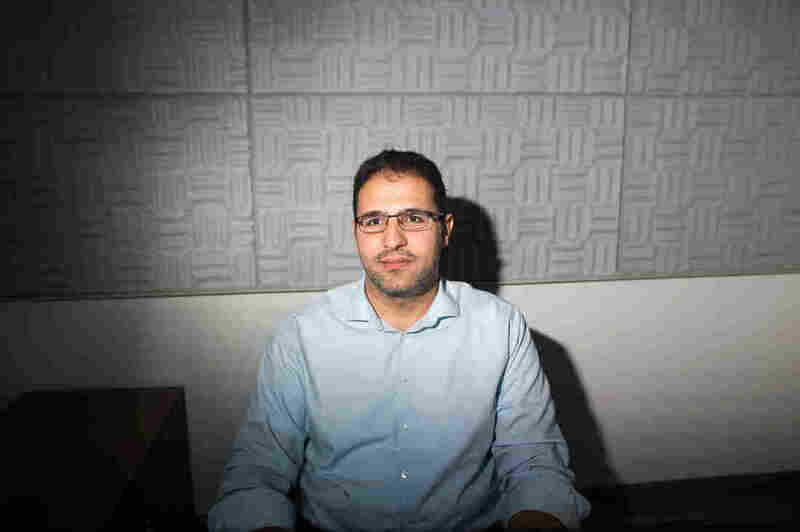 A Syrian-born human rights lawyer in Washington, D.C., is collecting those videos, hoping someday they will be used to build criminal cases against the perpetrators of the violence. But he also faces a major problem: The volume of videos is staggering. 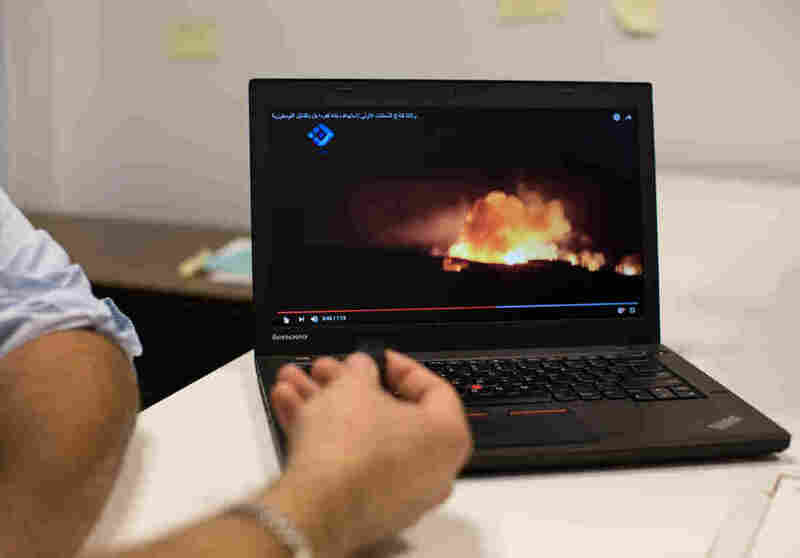 "We have 600,000 videos, and we're in the process of downloading almost 2,000 videos a day," says Mohammad Al Abdallah, executive director of the Syria Justice and Accountability Centre, a nonprofit supported by the State Department and a handful of European governments. Mohammad Al Abdallah is the executive director of the Syria Justice and Accountability Centre, a nonprofit supported by the State Department and some European governments. He says he was imprisoned and abused by the Syrian regime before he came to the U.S. in 2009. I ask Abdallah how the videos would be used as evidence in a courtroom, and he calls up an example on his computer screen. "I'll show you this one," he says. "It's a bit graphic. It's a very bloody video." The video, from 2012, was apparently taken with a cellphone. It shows men in a room beating five civilians. Abdallah says they are hospital workers. One of the men who seems to be in charge yells at and taunts the victims, and cheers when the attacks are especially vicious. The victims, barely moving, huddle in obvious agony on the floor of the room. There's blood splattered on the wall. But it's not only the brutality that makes the images captured in this video important to a lawyer. It's what else is in it. The perpetrators turned the camera on themselves. They're apparently Syrian government agents. They even say their names. Abdallah's organization, with a staff of 22, maintains a database of these thousands of videos to document the abuses. Analysts spend hours adding tags that identify what is in each video, so they can more easily search the database. One video purportedly shows Russian air force attacks on a northern suburb of Aleppo using white phosphorus. Tags might be straightforward, such as the date the video was made or the location where it was recorded. But some require human judgment. For example, if the video shows a weapon used in an attack, what kind of weapon is it? Is it an explosive, a mortar, a handgun, a baton? The tags have to make searching valuable. But the volume of videos Abdallah and his analysts are trying to process threatens to overwhelm them. "We envision ending up with a million-plus videos," says Abdallah. And that's just by the end of this year. Going through all of them and cataloging their contents in detail is both crucial — and impossible. "We're not going to be able to do this," says Abdallah. "We need help." The good news: Help may be coming. 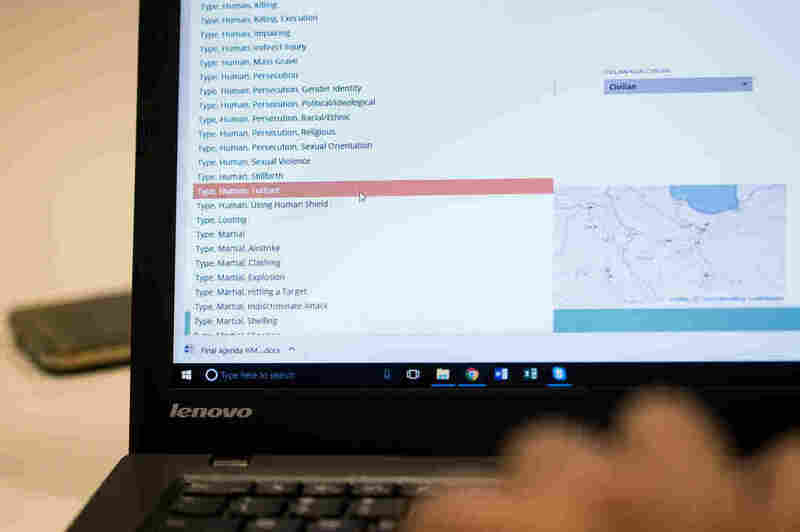 "What we're trying to do is create tools that allow the human rights community to gather as much information as possible," says Jay Aronson, the founder and director of the Center for Human Rights Science at Carnegie Mellon University. But the tools his center is creating will not just gather information. They'll also allow these organizations to "process and analyze it in a way that would have never been possible by hand, manually," he says. Aronson says his computer science colleagues have developed technology that allows you to rapidly go through an entire collection of video and find clips that contain, say, images of an ambulance or a helicopter. That's useful because helicopters are often used to drop makeshift bombs. This should help automate the process of tagging videos, taking some of the burden off human analysts. But Aronson admits computers have trouble with context. Is the helicopter delivering supplies or dropping a bomb? Is the ambulance coming in response to a brutal beating — or a heart attack? "There's no magic computer program that you can program and say, 'Hey, computer, find me barrel bombings or find me instances of torture,' and then have it go through all of the sources and just find those things," he says. Mohammad Al Abdallah displays labels for tagging content archived in the Syria Justice and Accountability Centre's database. Aronson says it will take human analysts to do that. But the tools Aronson and his colleagues are developing should make it easier to find videos that are related to one another, Abdallah says. And that's essential for amassing the evidence that will be needed in future criminal trials. He calls up another video with a gruesome scene. "It's five dead bodies, burned and thrown in the street, in Damascus suburbs," he says. And it turns out this video shows the same men who were being brutally beaten in the first video Abdallah showed me. He says you can tell that because it was taken the same day as the other video, and the victims are wearing the same clothes. "He is wearing a blue pajama, blue, with three stripes, and he's the exact same person as we see here," says Abdallah, indicating the first video. These videos came in from different sources, and taken together, they help provide a fuller picture of what happened. Abdallah says he's confident that computers will help make more connections so he can build strong legal cases against the perpetrators of the horrors that are part of daily life in Syria. "I think technology is gonna be the judge in this conflict," he says. There's one problem technology can't solve: Right now, there's virtually no legal mechanism to prosecute anyone for what's going on in Syria. But this evidence isn't going away. It will stay in databases like the one Abdallah's organization runs. And he hopes the time will come when the world will insist on some kind of accounting for the crimes for which he's gathered evidence.